Hey guys, so we were out last week looking for cushions for our living room. It’s always the same, you go out with a pocket full of cash and you find ‘nothing!’ We didn’t let this stop us from spending though, and we certainly found some bargains as we shopped in our local B & M store. 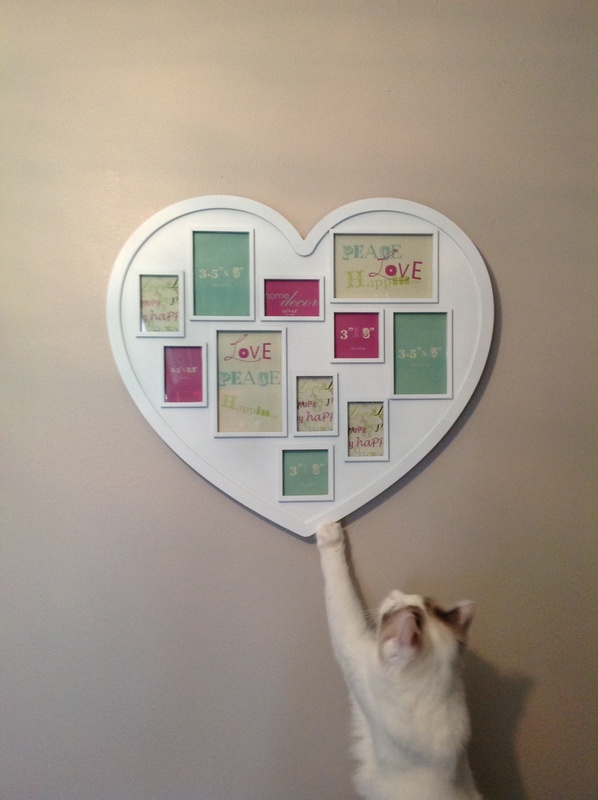 Check out this fantastic heart shaped white picture frame – £2.99 in the sale, what a steal! Rather than us raid through our Kodak photo prints, we decided to use Photo Box. Photo Box is a new website which we have come across recently where you can upload your desired image and follow some self explanatory instructions to get the print of your dreams. Once you are happy with your prints, Photo Box prints them in photograph form and posts them out to your chosen address. Photo Box is cheap and very time efficient – why chew on with camera reels etc, paying for a bunch of photos to be developed when you can just select off your computer which images you want and have them printed for next to nowt, right?! Besides, if you sign up to Photo Box you get free prints – meaning you only pay for your postage, bonus!